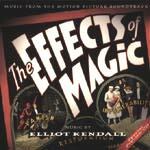 This special preview CD contains dialog and music for "The Effects Of Magic" film. Among the many fun and interesting tidbits are a couple of surfy things that merit review here. This whammy-dip guitar track jives right along, with the wow and twang of a Warner Bros. cartoon.... quite zippy. Properly glissandoed, and Venturistically delivered, this rhythmic number employs whammy and a surf beat. Though merely a sequence piece, it's a fine basis for a full blown surf tune. Mighty nice. Like the short 6th track, this is properly glissandoed, and Ventures styled. It delivers the promise of track six. Solid surf for celluloid, twang for the butter fingered popcorn crowd. tasty stuff.